Major clypeus with distinct median carina; large TL 15 mm plus; alitrunk profile convex with angular propodeum, petiole scale quite thick; trimorphic (?) minors with distinct posteriorly narrowed heads; soldiers dark red-brown to near black; minors lighter brown-orange to yellow-red. Most catalogued under Camponotus (Dinomyrmex) by Wheeler (1922: 962). 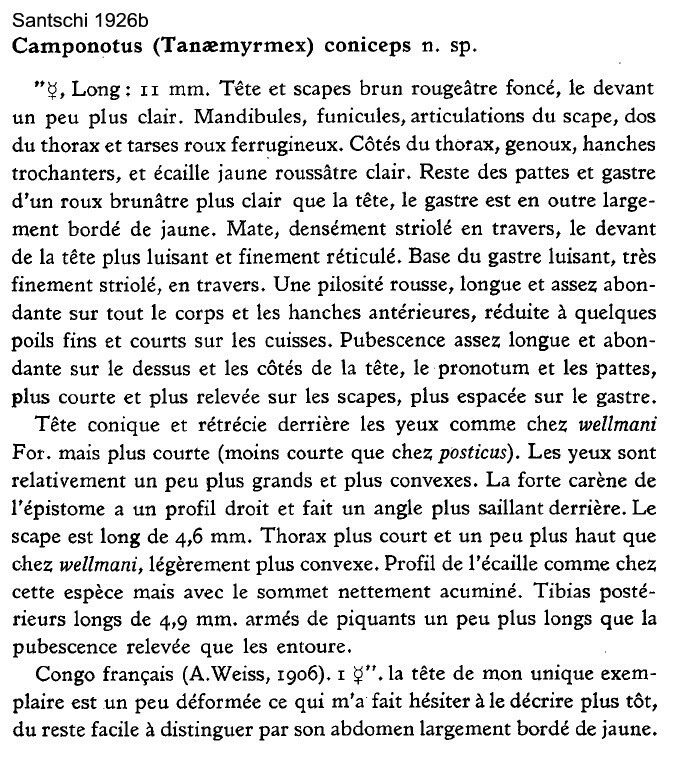 Type location Congo (Camponotus (Tanaemyrmex) coniceps n. sp., Santschi, 1926b: 258, worker, not illustrated) collected by Weiss, 1906 . Santschi's (1926b) description is at . The photomontage of the type minor worker is collated from http://www.antweb.org/specimen.do?name=casent0911933.